Russ, YGRR #3525 - Yankee Golden Retriever Rescue, Inc.
YGRR received a call from a Boston shelter in July 2002. 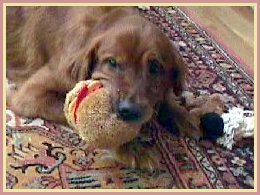 This big red boy had been picked up as a stray at an estimated age of ten and the required holding period was up. The shelter had named him Russ and said he had skin issues, hair loss, crusty eyelids, calluses on his elbows and ear infections. Shelter notes showed that Russ was not considered as a candidate for adoption since he was old and had too many health problems. A big note stating “Call YGRR” was on his file, which we were subsequently very happy to see. Since the shelter was full, a transport was quickly set up to bring Russ to Dr. Stuart B., one of YGRR’s veterinarians. Russ’s full blood chemistry screen revealed that he had pneumonia. Antibiotics were immediately administered and he was sent to Riverview where he was given round the clock care by Kennel Manager Sue A. Slowly, Russ responded and the staff was encouraged by his progress. He began to go for short walks and his appetite was great. A few weeks later, Russ was placed in the shaded corner of a play yard at 8:00 AM while the staff cleaned his run. It was predicted to be a very warm day and the staff moved dogs in and out quickly even though it was still early morning. Russ was not outside for more than a few minutes when it was discovered he had collapsed from an apparent heat stroke. Immediately, the staff sprang into action since they knew every second counted. Sue and her staff carried him into the kennel and wet him down with cold water. Russ was vomiting and unresponsive initially, but seemed to be coming around. The vet was called and Russ was immediately transported to the hospital. Dr. B. sprinted to the van and carried Russ into the hospital himself. Emergency medical support and IV fluids were given. Although it was touch and go, Russ survived because of the immediate action taken by the staff. Click here for more information on heatstroke. Russ continued to wait at Riverview for his new family. He was considered a special placement, since Russ preferred to be an only dog and did not like cats. His photo was featured on the YGRR Web site and in the Golden Times. Russ was very comfortable at Riverview and the staff became his family. The majority of adopters for our Senior Goldens already have another pet in the home, so Russ just had to wait a bit longer. Fortunately for Russ, a very special family who had adopted from YGRR in the past and had been members of the organization for many years saw Russ’s photo in the Times and somehow knew he was the dog for them. 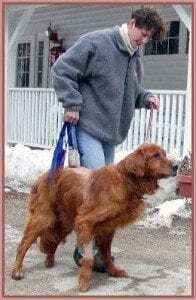 Their prior rescue Golden, Alex #1798, had passed away and they had no other pets at home. The family was always open to adopting a dog with special needs and Alex had been blind. When they called the hotline and left a message, there was a buzz of excitement at Riverview. In March 2003, Sue, Ed, and Tracey came to the facility to meet Russ and take him home. All went well and everyone agreed Russ had finally found his perfect family. Everything went smoothly the first few days. On March 5, Sue came home to find Russ unable to get up and use his back legs. He was rushed to an emergency hospital nearby and the family was were told that Russ had acute hind limb paralysis. It was explained that tests could cost thousands of dollars and the staff at the hospital was not hopeful about his prognosis. Sue called Sue A. at YGRR the next morning to give her the sad news. After getting over the initial shock, Sue A. asked if X-rays and bloodwork had been done to rule out basics such as a fracture or lyme disease. When Sue M. indicated that they had not, Sue A. asked if she could call as a representative of YGRR and ask the questions that needed to be asked. Sue M. called to give the authority for Russ’s care back to YGRR and found that they were just about to inject him with a syringe containing drugs for euthanasia. She asked them to hold everything until YGRR could speak with the attending physician. Ultimately, Sue A. received authorization from the President and Executive Director of YGRR to request a myelogram which would inject dye into Russ’s spine to find a proper diagnosis. This boy had come too far to make a decision to euthanize him without knowing specifically what was causing the problem. Ultimately, a compressive lesion was found around a disc in his spinal cord and surgery was successfully performed to remove the material. His prognosis was excellent! After a few days of recovery at the vet hospital, Russ came back to Riverview for physical therapy and to recuperate from the ordeal. It was expected that he would be there for six weeks but Russ did so well he was ready to go back home in four weeks! During this time, Sue and Ed came to Riverview to bring him a huge yellow duck stuffed toy to keep him company and take him for short walks. by Sue and Ed M.
Russ is quite a fellow with quite a story. He constantly demonstrates his strength and courage and he definitely does not see himself as a senior. His recovery from his paralysis is absolutely amazing. Each day he is stronger and more playful. Our challenge is trying to restrain some of his bouncy exuberance so he does not harm himself. Russ is a really big guy who has many loves. He loves to ride in the car; he begins all walks by approaching the car first with a hopeful expression on his face. His love for his stuffed animals has become his trademark. 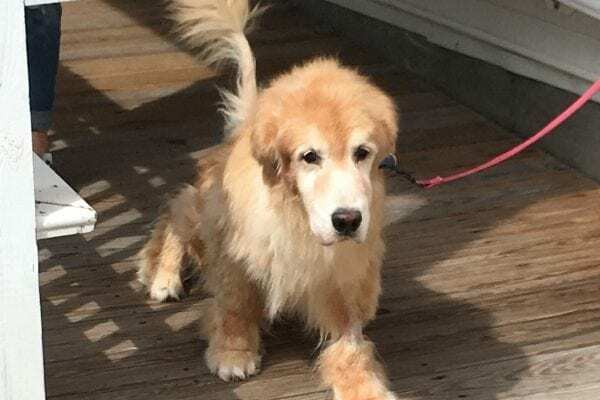 His collection began at the Tufts Veterinary Hospital during his surgery, and grew during his recovery time at the Yankee Golden Rescue facility in Hudson. He now has amassed quite a large number of stuffed toys and frequently has two or more in his mouth at the same time. Whether for a short walk or a long ride, Russ always brings a toy or two. As with all Goldens he takes well to spoiling and gets more than his fair share. He is a master at the Golden nudge, just in case anyone who is in the room is not completely focused on him. Russ appears to be discovering the ocean for the first time and he has made a few tentative approaches to the water (including trying to drink it), but for the moment he is content to roll joyfully in the sand and seaweed. Russ has the happiest of spirits and you just have to smile when you are in his presence. With his gangly gait, great strength and courage, and his puppy like enthusiasm, Russ has added tremendous joy to our lives and is a treasure we appreciate more and more each day.